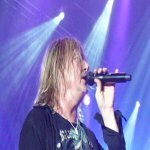 Def Leppard singer Joe Elliott was interviewed yesterday by various radio stations and he talked about plans for a 2015 world tour. Joe talked to KX92 about the Down 'n' Outz, the Summer Tour 2014 with KISS, Vivian's health and the intro to Rock Of Ages (Gunter Gleiben Glouten Globen). Joe talked to KFAB-AM about the Down 'n' Outz, the next studio album, Vivian's health, the NFL show and touring in 2015. Joe talked about UK Tour plans in July saying it would happen within 14/15 months and also that the tour would start Down Under. KISS recently hinted that the Def Leppard/KISS tour partnership would continue. Listen to one interview below and the second (2 part/30min) one via the link. "So we get back to work on that record this Autumn or Fall as you guys like to call it. And hopefully we'll have the thing you know artwork, title, running order all nailed by January. We wanna put the record out by April/May." "And then we'll start thinking then about where we're gonna go and play. It looks like we may start off on the other side of the world in like Australia, New Zealand, Japan etc and then work our way back through Europe and then come to the States July/August." "And I think what we're gonna do is start on the other end of the world. Australia/Japan. Work our way back through Europe and then hit the States maybe July/August."